Create CSS spritesheets simply and quickly. Is there a better alternative to SpriteRight? Is SpriteRight really the best app in Editors category? Will SpriteRight work good on macOS 10.13.4? SpriteRight makes creating CSS spritesheets simple. Import your existing CSS or image files and let SpriteRight pack your graphics into the smallest space possible. Make your sites load faster, cut bandwidth costs and save time. SpriteRight even generates CSS code on the fly. Get SpriteRight to find the optimal position for your images or position them yourself with a simple drag-and-drop interface. Set default margin values to evenly space out images or adjust padding on a per-image basis. Added live updating for sprite images. Users no longer need to manually refresh images. Any changes made externally will automatically be updated in the application. Added a new contextual menu item to the file list in cases where users would like to force a manual refresh. Added a new project icon. With full support for the latest CSS3 technologies, including multi-layered background rules, SpriteRight takes the sting out of creating time consuming spritesheets. Letting you get back to the stuff that matters. Easily maintain and manage spritesheets across multiple sites by creating SpriteRight project files. SpriteRight reads CSS files, letting you convert your existing website to use spritesheets in a matter of minutes. SpriteRight automatically generates CSS code as you work, making updating your stylesheets simple. Organise your spritesheets in the most optimal way possible using a variety of different sorting criteria. 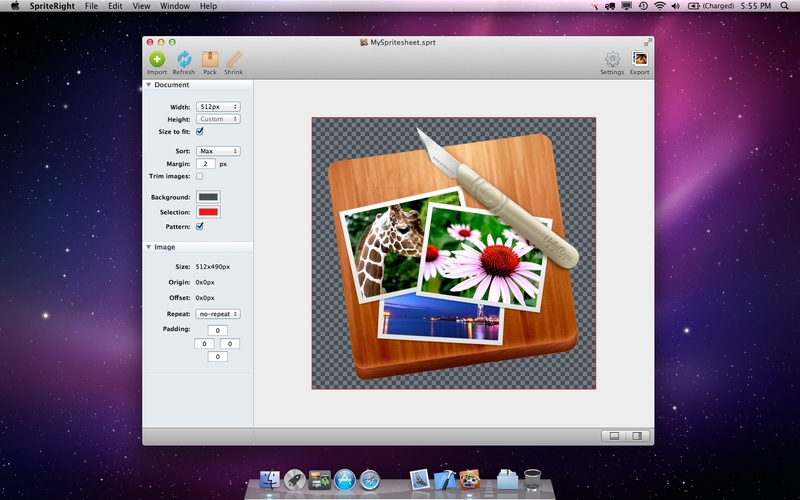 SpriteRights intuitive visual editor allows you to arrange your images in exactly the way you want.